Place the buttermilk, hot sauce catfish, mustard powder and paprika in a covered bowl, resealable plastic bag or marinating container, Stir to distribute spices. Refrigerate for 30 minutes to 1 hour. Drain the catfish and discard the marinade. Preheat oven to 350. Mix together the cornflake crumbs, chili powder, chipotle and ancho chile powders in a shallow bowl. 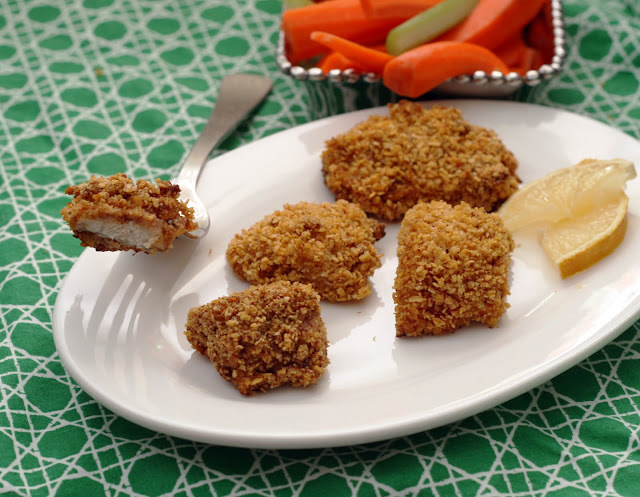 Dredge each nugget in the crumbs and arrange in a single layer on a parchment paper lined baking sheet. Bake 20 minutes or until fully cooked. My grocery store sells cut up catfish for even cheaper than catfish filets (I think it must be the ends leftover from cutting the rather long catfish into normal sized filets) which is just plain awesome. Normally prepped food is more expensive so I'm used to buying whole cuts of meat or fish and cubing it myself so to be able to buy something I love to eat and would be cutting up anyway for less is amazing! If you can't buy catfish already cut-up, I find the easiest way to cut it yourself is using kitchen shears. Normally I fry catfish when I'm eating it "plain" (aka not in gumbo, paella or étouffée) but in the interest of both health and ease of cooking, I thought I'd try to bake it instead. When I was a child, my mom would make chicken breast rolled in cornflake crumbs and I remember it being really crispy so I thought I'd try that on the catfish. My biggest pet peeve with baked "nuggets" or other food that is normally fried is that it is never crispy enough.The cornflakes did the trick! The nuggets were crisp and tasty and very moist.